Aleksandr Rodchenko (1891-1956) was a Russian artist who worked in many fields. He was a painter, sculptor, photographer, and graphic designer. He became an important spokesman in promoting the ideas of the government, particularly with his graphic design. Born in St. Petersburg to a working class family, Rodchenko had not exposure to the art world when he decided to become an artist, drawing inspiration mostly from magazines. He began studying at the Kazan Art School and then at the Stroganov Institute in Moscow. There he created his first abstract drawings and paintings, influenced by the work of Kazimir Malevich, as well as Cubism and Futurism. 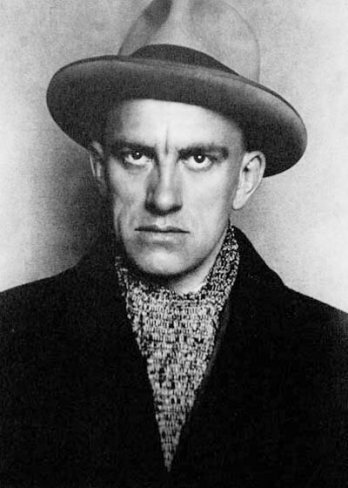 Rodchenko found success under the Bolshevik government and was given a bureaucratic job in which he helped found the Institute for Artistic Culture. Rodchenko transitioned into photography, creating powerful portraits and images of the state apparatus. The Stairs is a powerful and startling photograph. Showing this woman alone, carrying her child is an evocative image. Her loneliness appears to question the functioning of the state, especially in what looks like a central part of the city, but that may just be reading it with a modern eye. Certainly this woman appears powerful and determined. The sharp contrasts and distinct shadows reinforce that impression. The high vantage point and tilted angle of the photograph are quite off-puttting, putting the viewer in mind of something amiss and threatening. While the meaning of this picture may not be entirely clear, the emotional resonances are undeniable and the depth and skill that Rodchenko brought to his work are evident.